TripHobo, a Pune based online travel planning portal announced their Series B funding of USD 3 million led by new investor Mayfield and current investor Kalaari Capital. This is the second round of funding for TripHobo in the 12 months after a Series-A round in July 2014 (Read below). The funds would be used to primarily invest in R&D, talent acquisition, scaling content and technology integration with the travel ecosystem. Praveen Kumar, CEO, TripHobo said in regards to funding, “We’re excited to be now associated two of the leading VC firms in India. Three years ago, we set out to create a global product out of India. Being avid travelers, my co-founders and I felt that there was a massive space for innovation in customization of travel. I believe we’ve been vindicated both by our users, who continue to love the product; and our investors, who’ve reposed their faith in our vision. Mayfield and Kalaari bring decades of rich experience in working with and guiding startups across the globe and we’ll definitely benefit from that”. TripHobo, formerly known as JoGuru, was founded in 2012 by three marketing MBAs – Praveen Kumar from IIM Lucknow, Karthik Ramachandra, from IIM Indore and Saket Newaskar from MDI, Gurgaon. Currently TripHobo is home to over 70,000 user created itineraries and curated content for close to 400 top tourist cities worldwide. In addition to the travel planner platform, TripHobo also provides planning related information for over 50,000 points of interest that aid users in travel planning. The funds raised by TripHobo will be utilized to invest in platform upgradation, increasing the number of itineraries and content for destinations. TripHobo currently has over 25000 user created itineraries and curated content for close to 200 top tourist cities worldwide. We spoke to Saket Newaskar, CTO, TripHobo and he told us that they are now aggressively looking at developing a mobile app that will help mobile users to create travel itineraries on mobile devices. 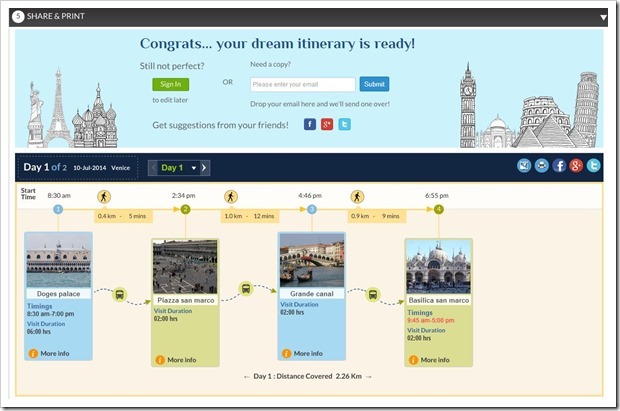 We tested out TripHobo’s itinerary creation on their portal for Venice, Italy and it gave us a beautifully laid out travel plan in the end. What’s more, travelers can also book hotels recommended by TripHobo, so they do not have to visit any other site for hotel bookings. The hotels are recommended based on the location of attractions, so it is easier for transportation. TripHobo has currently done backend integration with Booking.com for hotel recommendations and ratings. Travelers creating itineraries are essentially strong leads that TripHobo wants to capture and offer them to travel services providers who can value add to travelers’ needs on their trip. They take explicit consent from the travelers before sharing their details with other service providers. Apart from this TripHobo also gets about 5 to 15 percent commission from hotel bookings that happen through their site. While they do not have any payment gateway integrated on their site as yet, they have complete access to backend of booking.com which allows they to monitor the number of bookings through them. Apart from OTA’s, TripHobo is also currently in talks with generic tourism companies like SOTC and Thomas Cook for tie-ups. The website is pretty neat and clean. The technology is brilliant. They’ve the potential of becoming the next big thing in travel industry. All the best to the Team TripHobo.